Seeking a gritty, realistic look for his wry crime film Jackie Brown (1997), writer-director Quentin Tarantino and cinematographer Guillermo Navarro, ASC, AMC found inspiration by screening Ulu Grosbard’s 1977 heist classic Straight Time (shot by Owen Roizman, ASC). Tarantino admired the film’s raw vision of Los Angeles, as well as its blending of location and studio work with a cinematographic style that mimics an available light ambiance. Tarantino and Navarro also watched Robert Culp’s 1972 action melodrama Hickey and Boggs (photographed by Bill Butler, ASC) and Peter Bogdanovich’s 1981 farce They All Laughed (Robby Müller, BVK, NSC). 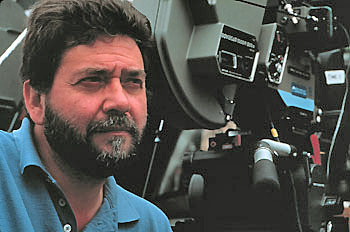 The director felt that each of these films made interesting and realistic use of the metropolitan landscapes of L.A. and New York, respectively. In adapting Elmore Leonard’s crime thriller Rum Punch, Tarantino transplanted the novel’s narrative from Miami’s South Beach to L.A.’s South Bay, an area which encompasses the towns of Torrance, Hawthorne, Carson, Wilmington, Long Beach, San Pedro, Palos Verdes, Inglewood and Marina Del Rey. In the production photo at the top of the page, by Darren Michaels, Steadicam/A-camera operator Dan Kneece, key grip Rick Stribling (on ledge) and dolly grip Robert “Dolly Bob” Ivanjack execute the film's title sequence, an extensive tracking shot of Jackie — played by actress Pam Grier — hustling through an iconic passageway within the Los Angeles International Airport.